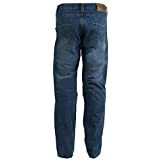 100% 280GSM Knitted Kevlar lined jeans with FREE knee & hip armour to be inserted into inside pockets on the jeans. Kevlar is a soft knitted non abrasive material, which is comfortable against the skin. You must be sure to buy the right Kevlar product as many are mixed with other materials and are not sustainable or endorsed by Dupont.